Honda EU22i vs EU20i – What’s the Difference? 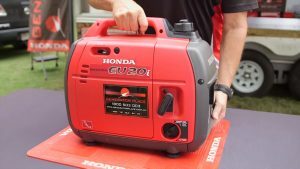 The Honda EU20i has long been one of the most popular portable generators among campers and caravan owners, providing reliable power for a variety of devices and appliances on the road. But with campers using more power-intensive units on-site, they now need more powerful generators that provide the same performance and portability as the EU20i. Luckily for you and other campers, the recently launched Honda EU22i provides just that – and more! Bigger and More Powerful Engine. The EU22i features a 4-stroke engine that’s 20% larger than the EU20i, producing 10% more power than its predecessor. It also provides up to 2200W of power and up to 8 hours of continuous use when on the Eco-Throttle+ mode. Higher Start-Up. The EU22i provides start-up power just short of 4000watts, making it more capable of starting up air conditioning units and other tricky appliances that most portable generators often have trouble with. Coloured Vent Caps. By providing coloured vented caps, it will be easier remembering to put the vent caps to the ‘On’ position whenever you run the EU22i. Start String Reinforcement. The EU22i features a metal reinforcement around its pull cord, providing more protection and increasing its durability. This metal sheet prevents damage to your unit, especially after drawing the cord several times after many years. Fuel Off Switch – The EU22i features a handy ‘Off Fuel’ position on its switch, which you can use to safely run your generator out of fuel whenever you need to. This option is particularly useful if you’re not planning to use your generator for a long period, allowing you to use up the remaining fuel, so it doesn’t damage the engine. It also helps prevent the build-up of stale fuel in your unit, which can help ensure that your unit performs at optimum levels for longer. For more information on how the EU22i improves upon the EU20i, watch this video to find out more. With more power available and a higher start-up range, the EU22i can power several devices and appliances in your unit – often at the same time! The EU22i’s higher load capacity and power output also give you more options for using different appliances simultaneously, making life on-site easier and more convenient. Watch the EU22i in action to see how well it can perform for your trip. For many campers, the EU20i was the ultimate portable generator. Light yet powerful, the EU20i provided most of the power and features that most campers look for in a portable generator for camping and road trips. But with all the upgrades and improvements that the EU22i offers, there’s now a new leader in the world of portable generators. The EU22i takes everything that made the EU20i so good and added a variety of features to make it even better. It provides even more power and the same high performance – at roughly the same size and weight. 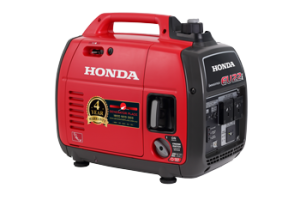 If you’re looking for a powerful, reliable, and quiet portable generator for your camping or caravanning trip, the Honda EU22i has you covered. Got more questions about the Honda EU22i? Call 1800 442 447 to find out more.